Once upon a time I did not drink tea. 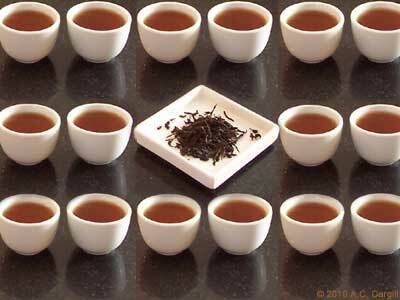 In fact for most of my life I did not drink tea. Then, nearly a decade ago I began to drink it, then decided I kind of liked it, and then decided I liked it so much that I would write about it. Nearly nine years after beginning to write about tea I can definitively say that I’ve consumed a lot of tea. But I regret to say that I can’t tell you how much. Not that I’m concerned about the total quantity of tea that I’ve consumed. I’d bet that it’s enough to fill a bathtub and maybe a few of them but probably not enough to fill a swimming pool. And I’m pretty sure that it’s not enough to float a battleship. But I would like to know how many varieties I’ve sampled over the years and what they were and perhaps just a bit about what they tasted like and other pertinent details. Which is my way of saying that I wish I’d kept something like a tea diary or journal over the years, and I’d encourage any tea drinkers that are starting to get serious about it to do the same. When you write about tea and you have a somewhat visible tea site, you end up getting a lot of free tea sent your way. Which is fine and dandy with me. I also end up buying a lot of tea because let’s face it there’s a lot of tea in the world and the freebies don’t always match with my tastes and so there are plenty more teas that I’d like to try. I’ve written a bunch of reviews at my site – more than 150 in all. Which sounds like a lot but it’s spread out over more than eight years and it’s only a small fraction of the many teas I’ve sampled during that time. And quite honestly writing a review is a commitment of time that I find myself less willing to make nowadays. What I find myself wishing I’d done was just to keep a very basic tea diary, with just the most pertinent facts about the tea in question, as well as some brief thoughts or tasting notes. Regarding the latter, even a line or two would have been sufficient. It would have made for good reading and as I looked back over it after all these years. But hindsight is always 20-20 – or something like that.